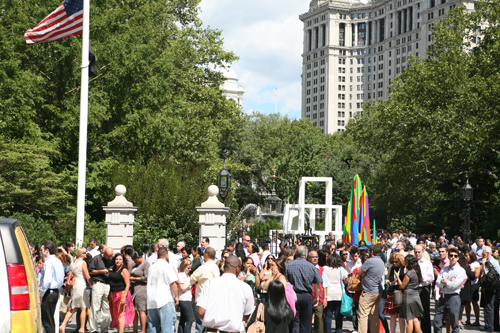 At City Hall Park thousands waited for the all's clear to return to their offices. A routine Tuesday afternoon came to an abrupt halt as our desks at AN HQ on Murray Street in Manhattan began to shake, rattle, and roll. As we grabbed our phones, commenced tweeting that we were among the survivors, and ran for the stairs, it appeared that New Yorkers all around City Hall had been suddenly given a recess to hang out in the streets. It turned out to be the strongest quake in the City since the 19th century at a magnitude 5.9 and was centered in Mineral, VA, about 90 miles from Washington, D.C. where stones fells from the National Cathedral. 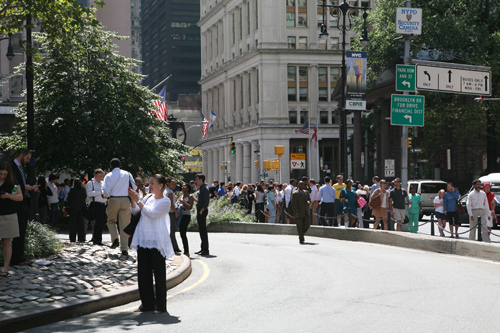 Buildings were evacuated up and down the east coast from Boston to North Carolina although little damage was reported. Students wait outside the New Amersterdam library. The crowd in front of St. Paul's Chapel.